Santi Corsi, The Saturn Room, Palazzo Pitti, Florence, oil on canvas. Collection of the Sarjeant Gallery Te Whare o Rehua Whanganui. Gift from Miss M Duncan, 1947. On Saturday 26th September 2015, the Sarjeant Gallery Te Whare o Rehua reopened its doors to the public after three months of closure while repairs were made to the flood damaged building. Included in the suite of opening exhibitions is my own show, All that Glitters, a collection show with a focus on humans’ inherent fascination with gold. All That Glitters uses paintings, photographs, prints and sculptures that I have chosen from the goldmine that is the Gallery’s collection store. The work that first sparked this exhibition concept was Gretchen Albrecht’s Nocturne (the spiral unwinds). A firm gallery favourite this large oval painting is powerfully mesmerising with its spiralling vortex of gold brushstrokes and vibrant blues and purples. Painted by Albrecht in the early 1990s it draws inspiration from the poem, Nocturno de San Idlefonso, by Mexican writer and poet, Octavio Paz. Also on display is a gold framed image of the Gallery’s first director, Gordon H. Brown, painted by Colin McCahon in 1968. McCahon’s portrait sits comfortably between a pyramidal etching by Rodney Fumpston and photographs by Richard Wotton, one of which details the entrance at Whanganui’s Cooks Gardens. Other works of note include the gold kitchen sink “skin” by New Plymouth born artist, Glenn Burrell and photographs by Andrew Ross on gold toned printing out paper. Ross’ images depict empty building interiors caressed by radiant glowing light. All that Glitters could not be complete without an opulent gilt frame. The Sarjeant is fortunate enough to have over 150 paintings mounted in ornate frames, some of which are examples of the Gallery’s earliest acquisitions. St Pol de Leon, Brittany by Terrick Williams and Market Scene, Brittany by Albert Ludovici were purchased for the collection in 1912 and 1913 respectively. Both depict French market scenes and are two of the initial ten Sarjeant Gallery acquisitions. 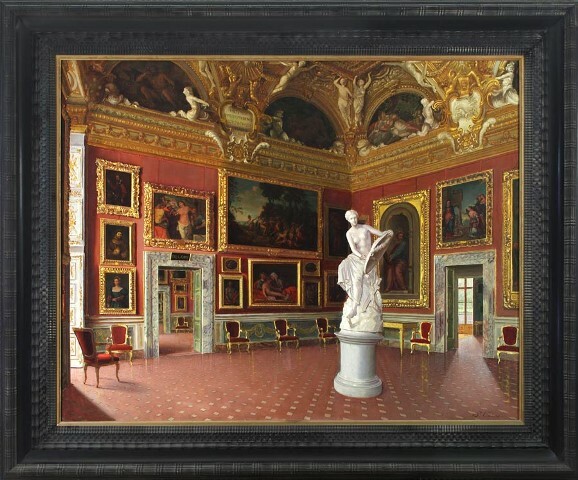 Closing the show is a large work by Italian painter, Santi Corsi, which depicts the interior of the Saturn Room at the Palazzo Pitti in Florence. This sizeable painting shows a lavishly decorated room. The walls are hidden by a salon style hang of paintings and the ceiling is richly decorated with gold detailing. Corsi was active in the early 20th century and is most known for his paintings of the Palazzo Pitti’s interior rooms. As a Collection Transition Assistant my colleagues and I have spent the past 17 months tirelessly relocating the Gallery’s collection from Queens Park to Sarjeant on the Quay. As a collective we have seen, packed and unpacked the entire collection. All that Glitters is the end result of this hard work – a small taste of some of the works that captivated me and made my job as good as gold.